All the basics for economically housing your system. 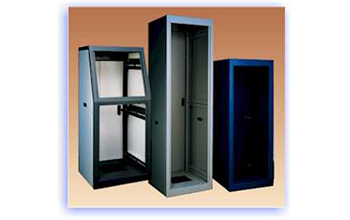 Vertical and sloped front enclosures. The Spartan Series offers all the basic requirements for housing electronic systems in a rugged, economical package designed with simple, clean lines. 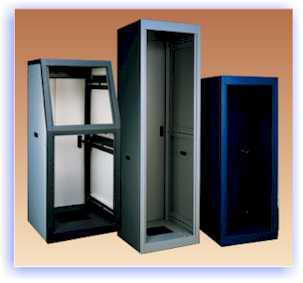 The Spartan Series incorporates, as standard, provisions for mounting electronic equipment and accessories required in the majority of systems packaging.Standard modifications are readily available to customize enclosure packaging for your complete needs. Finished in all standard Premier colors shown oncolor chart. 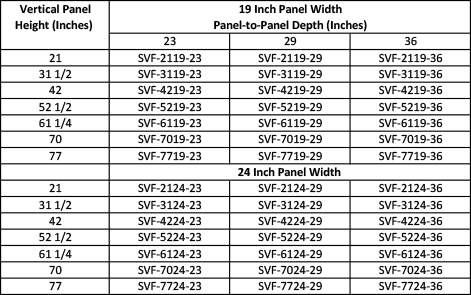 30° and 45° matching wedge frames are available for multiple bay console configurations. 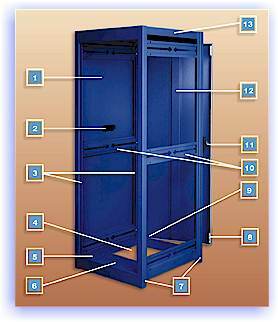 (1 frame, 2 end panels, rear door) All features shown are standard in the Spartan Series. Welded, formed steel construction. Frame with trim and 2 pairs of adjustable panel mounting angles (tapped with 10-32 holes on EIA spacing); 2 Universal rails avalible upon request. Side panels are flush mounted, outside removable with recessed hand grip. Interchangeable left or right. Available louvered or slotted at additional cost. Mounts left hand or right hand, front or rear with concealed hinges and is instantly removable. Magnetic catches on closure side. Furnished with a recessed handle, lock and 2 keys. 1/4 inch thick plexiglass front surface permits viewing of instrumentation through closed door, retaining all the features of the standard Spartan door, such as: quick release hinges, magnetic closure, keyed lock and flush handle. Smoke Gray is standard. Other colors available.